The metagenome contains plenty of genetic resources and can be used to search for the novel gene or mutant. In this study, the bacterial laccase gene (cueO) with single or multiple mutations was directly cloned based on the metagenome of a chemical plant sludge. An interesting mutation (G276R) was identified from those cloned mutants. The other mutants (G276N, G276Y, and G276K) with improved catalytic efficiency were identified by the saturation mutagenesis on residue G276. The optimal temperature for wild-type CueO enzyme activity was about 70 °C, compared to 60 °C, 50 °C, 50 °C, and 30 °C for the G276R, G276N, G276Y, and G276K mutant enzymes, respectively. The catalytic efficiency (k cat/K m) with 8 mmol Cu2+ of the G276R, G276N, G276Y, and G276K mutants was 1.2-, 2.7-, 1.3-, and 2.7-fold, respectively, compared to the wild-type enzyme. In addition, the mutants G276R, G276N, G276Y, and G276K oxidized the carcinogen benzo[α]pyrene more efficiently compared to the wild-type enzyme. All of the results indicate that G276 of CueO plays an important role in enzyme activity, and the useful mutants can be identified based on the metagenome. Laccase (EC1.10.3.2) is a blue copper oxidase with a broad range of substrates (Kalyani et al. 2015), varying from organic to inorganic compounds such as diphenols, aromatic amines, polyphenols (Hoegger et al. 2006; Rivera-Hoyos et al. 2013; Sharma et al. 2007), and Mn2+ (Brouwers et al. 1999). The reactions of laccase are mediated by a one-electron transfer mechanism (Thurston 1994). Therefore, these enzymes can be used as biosensors for drugs and phenols (Ghindilis et al. 1992; Peter and Wollenberger 1997) and in textile dye bleaching (Claus et al. 2002), polymer synthesis (Huttermann et al. 2001), bioremediation (Murugesan 2003), pulp bleaching (Palonen and Viikari 2004), fungicides, and clarification of juices and wines (Bezerra et al. 2014). Laccases are widely distributed among higher plants (Chen et al. 2015; Rivera-Hoyos et al. 2013), insects (Loncar et al. 2013; Hoegger et al. 2006), fungi (Eggert et al. 1996), and bacteria (Claus 2003; Si et al. 2015). Bacterial laccases play an important role in melanin production, spore coat resistance, morphogenesis, and copper detoxification (Sharma et al. 2007). Bacterial laccases have several advantages over fungal laccases (Ihssen et al. 2015; Su et al. 2013), such as Cu2+ resistance (Hullo et al. 2001; Komori and Higuchi 2015) and pH (Ruijssenaars and Hartmans 2004) and thermal (Suzuki et al. 2003) stability. In addition, bacterial laccases do not need to be glycosylated and so have considerable potential for use in industrial applications (Sharma et al. 2007). The majority of microbes cannot be cultured by traditional methods. The metagenome contains a large number of functional genes. Therefore, metagenomic analyses facilitate the discovery of novel genes in biological communities by overcoming the limitations of cultivation-dependent approaches (Guazzaroni et al. 2015; Leis et al. 2013). Kellner et al. analyzed the diversity of bacterial laccase genes in samples from forests and grasslands and found 16 distinct sequence-type clades of bacterial laccase (Kellner et al. 2008). Kellenberger et al. evaluated the spatial distribution and function of fungal laccase genes from a forest cambisol (Kellenberger 2001). These studies have indicated that the metagenome contains many genetic resources. In addition to the various laccase genes, the metagenome may also contain many useful mutations of a target laccase gene. In this study, we refer to an extensively studied laccase gene cueo from E. coli K12 as the wild type (Zeng et al. 2011). Many interesting mutants with high activity were identified from the metagenome of bacteria in chemical plant sludge. The ability of the CueO protein and its mutants to degrade benzo[α]pyrene, a mutagenic and highly carcinogenic environmental polycyclic aromatic hydrocarbon (PAH), was evaluated (Zhao et al. 2013). The results indicate that the cloned cueO mutants could catalyze transformation of PAHs, similar to the function of fungal laccase from Trametes versicolor (Zeng et al. 2011, 2016; Hullo et al. 2001; Roberts et al. 2002). Therefore, useful mutants can be identified from the metagenome, increasing our understanding of the genetic diversity of the functional gene. Luria–Bertani (LB) medium contained 1% peptone, 0.5% yeast extract, and 1% NaCl (pH 7.0). Escherichia coli strain BL21 (DE3) and DNA polymerase were purchased from Qiangen (Beijing, China), and T4 DNA ligase and the BamHI and HindIII restriction enzymes were from New England Biolabs. Autoinduction medium was purchased from Biolab. The metagenome was extracted from a chemical plant sludge in Jiangxi Province, China. Cells were lysed by incubation in 20 mL cetyltrimethylammonium bromide containing 50 μL protease (20 mg protease per milliliter) at 37 °C with shaking at 250 rpm for 30 min. Then, 5 mL 2% SDS was added, followed by incubation for 2 h at 65 °C to denature protein and freeze thawing to enhance cell lysis. Protein was extracted using phenol/chloroform/isopentanol (25:24:1). DNA was precipitated by addition of a 0.6-fold volume of isopropyl alcohol followed by washing in 70% ethanol to remove basic ions. The cueO gene fragment was amplified from the sludge metagenome using the Taq Plus DNA polymerase with the forward primer cueO-F, which contains a unique BamHI restriction site at the start codon of the open reading frame, and the reverse primer cueO-R, which contains a HindIII restriction site. The PCR conditions were as follows: an initial denaturing step at 95 °C for 5 min followed by 30 cycles of 95 °C for 30 s, 60 °C for 30 s, and 72 °C for 1 min 40 s. The PCR products and the vector were digested with BamHI and HindIII and purified using the Axyprep DNA Kit (Axygen) and PCR Purification Kit (Qiangen). The purified product was ligated into the pET-30a(+) vector overnight using T4 DNA ligase at 16 °C. Escherichia coli BL21 (DE3) was transformed with the ligation mixture, and transformants were selected in LB medium containing 50 μg kanamycin per milliliter. The recombinant plasmid was verified by PCR, and positive clones were sequenced. Escherichia coli BL21 (DE3) cells harboring the recombinant gene were cultured in 3 mL LB medium supplemented with kanamycin (50 μg/mL) at 30 °C with shaking at 120 rpm to an OD600 of 0.6. Then, 0.1 mM isopropyl-β-d-thiogalactopyranoside and 0.25 mM CuCl2 were added to the culture medium, and the temperature was reduced to 25 °C. Incubation was continued for a further 4 h, during which microaerobic conditions were achieved by switching off the shaking function (Nasoohi et al. 2013; Brander et al. 2014; Durao et al. 2008). Cells were harvested after a further 20 h of growth by centrifugation at 8000g for 10 min (Durao et al. 2008). The pellets were resuspended in 50 mM Tris/HCl buffer (pH 8.0). The cells were disrupted by sonication on ice, and debris was removed by centrifugation at 4 °C and 13,000g for 5 min. The recombinant proteins were purified with Ni–NTA Superflow (QIAGEN, U.S.) according to the manufacturer’s instructions. The concentration of the expressed laccase protein was determined using a 2100 BioAnalyzer instrument (Agilent Technologies, Palo Alto, CA). To evaluate the expression and specific activity of mutants, we generated single-point mutations in the residues that differ from the sequence of the wild type in the mutants M1 to M6 using the PCR mutagenesis strategy (Kirsch and Joly 1998). The primers cueO28-F, cueO48-F, cueO63-F, cueO116-F, cueO135-F, cueO250-F, cueO276-F, cueO318-F, cueO385-F, cueO390-F, cueO413-F, cueO444-F, cueO464-F, cueO471-F, and cueOM-R were used to generate the single-point mutants. Saturation mutagenesis of G276 was performed using the primers G276-F and cueOM-R. A saturation mutagenesis library at site G276 was constructed, and the mutation site was designed using the method of NNK degeneracy (N, adenine/cytosine/guanine/thymine; K, guanine/thymine) to encode all 20 amino acids (Tian et al. 2013). PCR products were ligated into the pET-30a(+) vector and transformed into BL21 (DE3) cells. The mutants were incubated in 96-well plates in an autoinduction medium at 30 °C with shaking at 200 rpm (Ukkonen et al. 2013; Li et al. 2011). After 24 h, the cells were harvested by centrifugation at 12,000g for 1 min, and the pellets were resuspended in 20 mM Tris/HCl buffer (pH 8.0) containing 20% sucrose, and the mixture was placed on ice for 30 min and centrifuged at 12,000g for 15 min. The pellets were resuspended in 20 mM Tris/HCl buffer (pH 8.0) and placed on ice for 1 h. The cell suspensions then were centrifuged at 12,000g for 20 min, and enzyme activity in the supernatants was assayed at 37 °C and pH 4.5. Laccase activity was assayed at 60 °C using 2,2-azino-di-(3-ethylbenzthiazoline-sulfonate) (ABTS) as substrate. The assay mixture contained 200 µL 5 mM ABTS and 750 µL 50 mM citrate/phosphate. The increase in absorbance due to the oxidation of ABTS at 420 nm was measured (ε 420 = 36,000 M−1 cm−1). One unit was defined as the amount of enzyme that oxidized 1 μmol of substrate per minute. The optimum temperature was examined at pH 4.5 in the presence of 1 mM ABTS at 0–100 °C. A mixture of ice and water was used to maintain the temperature at 0 °C. Enzyme activity at pH 2.1–7.5 was evaluated. ABTS and 0.1 M citrate phosphate buffer were incubated at the optimum temperature of each protein 2 min before addition of enzyme. Kinetic analyses were performed using 0.2–10 mM ABTS, 8 mM Cu2+, and citrate phosphate buffer after incubating at the optimum temperature for 2 min. The reaction was initiated by addition of 50 μL purified enzyme. Each test was carried out in at least three replicates. The K m and k cat values were calculated by non-linear regression using GraphPad Prism 5.0 (GraphPad Software Inc., La Jolla, CA). T m (melting temperature) values of CueO and its mutants were determined by differential scanning calorimetry (General Electric Company, Louisville, KY, USA) using ≥ 400 μg of sample per milliliter (Jian Tian et al. 2015). The scanning temperature was from 20 to 110 °C in the PBS buffer (pH 7.4). Oxidation of benzo[α]pyrene by CueO and its mutants was studied at pH 3.5 by reacting 0.3 mg benzo[α]pyrene per liter with 200 μg laccase per milliliter (30 °C) or 4 μg laccase per milliliter (60 °C). To facilitate degradation, we added ABTS (0.5 mM) to a 200 µL reaction system. After incubation at pH 3.5 for 12 h at 30 and 60 °C, the reaction was terminated by incubation for 1 h in an ice–water mixture, and the mixture was diluted by addition of 800 µL acetonitrile. Benzo[α]pyrene in the reaction system was determined quantitatively using a Shimadzu LC-20AB high-performance liquid chromatography system equipped with a fluorescence detector (RF-10AxL). Benzo[α]pyrene was separated on a C18 column (4.6 × 250 mm, 5 µm; Waters, USA) by gradient elution at a constant flow rate of 1 mL/min with a mobile phase A (acetonitrile) to mobile phase B ratio of 98:2. The amount of benzo[α]pyrene was determined using a fluorescence detector with excitation and emission wavelengths of 297 and 408 nm, respectively. The metagenome was extracted from the sludge of a chemical plant in Jiangxi Province, China. Primers (cueO-F and cueO-R in Additional file 1: Table S1) were designed to amplify the cueO gene. The PCR product was 1467 bp in length, and contained a termination codon. The PCR product was digested with BamHI and HindIII, then ligated into the pET-30a(+) vector and 30 different positive clones were sequenced. Based on the sequencing results, there were 16 sequences, which are identical to cueO (NCBI gene ID: 947736) of E. coli K12 and referred as the wild-type cueo in this study. In addition to the wild-type cueO, we also identified 14 cueO mutants, including eight mutants containing the synonymous mutations and six mutants containing the non-synonymous mutations. Some of the mutants contained multiple mutations, as shown in Fig. 1. The fidelity of the PCR polymerase was also evaluated. The same primers (cueO-F and cueO-R in Additional file 1: Table S1) were used in the PCR with the wild-type cueO gene as the PCR template. The PCR product was digested with BamHI and HindIII, then ligated into the pET-30a(+) vector and 30 different positive clones were also sequenced. The sequencing results indicated that the PCR polymerase had very high fidelity, as the 30 different positive clones containing the cueO gene did not contain any mutations. Therefore, the cueO mutations detected in the metagenome were not due to errors during PCR amplification. The 6 non-synonymous mutants (M-1 to M-6) and wild-type cueO were expressed in E. coli BL21(DE3), and their activities in the cell lysate were determined. The M-2 mutant showed the highest activity in cell lysate. However, the activities of the M-1, M-3, M-4, M-5, and M-6 mutants in cell lysate were lower than that of wild-type CueO (Fig. 2). As the six mutants contained multiple mutations, we generated enzymes with only single-point mutations, expressed them in E. coli, and determined their activity. To evaluate the activity of the mutants via high-throughput screening, cells containing the mutants were broken by osmotic pressure (Nossal and Heppel 1966). The activity in the supernatant of all mutants was measured under the same experimental conditions (pH 4.5 and 37 °C). As shown in Fig. 3, the G276R mutant exhibited about sevenfold higher activity than wild-type CueO. The activity of the other mutants was similar to that of wild-type CueO. Therefore, the residue G276 of CueO plays an important role in enzyme activity. The tool of CDD (Conserved Domain Database, CDD) in NCBI (Marchler-Bauer et al. 2015) was used to detect the conserved residues in CueO. The residue G276 in Cueo was not conserved and could be mutated to the other amino acids. In this study, the expression host strain is E. coli BL21(DE3) which contains the gene of cueo. However, the activity of the expressed Cueo from the native host E. coli BL21(DE3) is difficult to be measured with the standard method, as the expressed amount of the enzyme from the native host is very low. In addition, the expression vector pET30 was used to express the gene cueo and the mutants. Therefore, the expression host E. coli BL21(DE3) was selected in this study. As the residue G276 was not conserved and related to the catalytic efficiency, a saturation mutagenesis library on the residue G276 was constructed. The wild-type cueO gene and mutants were expressed in E. coli BL21 (DE3) using the pET expression system. Over 150 clones were subjected to screening for laccase activity higher than that of wild-type CueO. In addition to G276R, three other mutants (G276K, G276Y, and G276N) were identified and exhibited activities superior to that of the wild type. 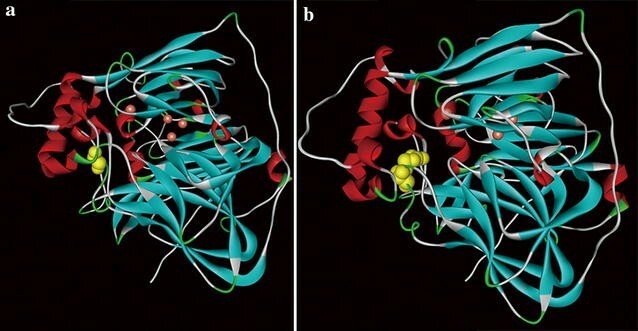 At pH 4.5 and 37 °C, the activity of G276N was threefold higher than the wild-type enzyme and the other mutants were twofold higher than that of the wild-type enzyme (Fig. 4). Fungal laccases have optimal temperatures of 30–55 °C; however, bacterial laccases tend to show activity at higher temperatures (Rivera-Hoyos et al. 2013; Sharma et al. 2007). The wild-type and mutant proteins were expressed, purified, and migrated as a single band at an apparent molecular mass of ~ 60 kDa on SDS-PAGE (Additional file 2: Figure S1). The optimal temperatures of the wild-type and mutant CueO were measured. The optimum temperature of wild-type CueO was ~ 70 °C, compared to 60, 50, and 30 °C for the G276R, G276N, and G276K mutants, respectively (Fig. 5a). Notably, the mutants exhibited higher activity at 0 °C than that of the wild type. The T m values of wild-type, G276R, G276K, G276Y, and G276N CueO proteins were determined by differential scanning calorimetry (DSC) to be 80.9, 76.2, 75.6, 77.4, and 75.2 °C, respectively. Therefore, mutation of G276 affected the stability of the enzyme. However, as the G276R, G276K, G276Y, and G276N mutants exhibited T m values > 75 °C, they were stable proteins. The wild-type and mutant CueO enzymes exhibited the highest activity under acidic conditions (Fig. 5b). Moreover, the optimum pHs of the G276K, G276Y, and G276N mutants were lower than that of the wild type. At pH 2.5, the G276K, G276Y, and G276N mutants exhibited ~ 100% of their maximum activities. Therefore, these enzymes should be used under acidic conditions. We determined the kinetic properties of the purified enzymes (Table 1). The catalytic efficiencies (k cat/K m) of the mutants under optimum conditions (including the optimal temperature and optimal pH) were higher than that of the wild-type enzyme. Therefore, the G276 residue is important for enzyme activity. The active sites in laccase include at least four Cu atoms and can be classified into three types according to their spectroscopic properties: type 1 (T1), type 2 (T2), and type 3 (T3); the two types of Cu sites (T2 and T3) form the trinuclear copper center (Malmstrom 1982). The substrate is oxidized by the T1 copper atom and the electron is conducted through the core of the protein to the T2/T3 site, where four electrons are used to reduce dioxygen to water (Solomon et al. 2008). Mutations at E106, Cys500, Asp112, and Glu506 of CueO can affect the electronic state of the trinuclear copper center and enzyme activity (Kataoka et al. 2009; Komori et al. 2013; Nasoohi et al. 2013). In this study, we identified CueO mutants at another position (G276) with high activity; in particular, the G276R mutant exhibited greater activity than the wild-type protein. Structural analyses revealed that the G276 residue is located near the active site of the enzyme and close to the methionine-rich helix (residues 329–343) (Prins et al. 2015; Roberts et al. 2002) (Fig. 6). Some studies showed the methionine-rich helix region to be largely helical and to cover the substrate-binding region (Roberts et al. 2002; Singh et al. 2011). Therefore, the mutation on G276 may alter the conformation of the methionine-rich helix region. The structural changes may promote the substrate binding and increase of the mutant in catalytic activity. However, this hypothesis should be verified by determination of the crystal structures of the CueO mutants in the future study. The CueO laccase and mutants thereof were capable of oxidizing benzo[α]pyrene (Fig. 7a, b). Both the wild-type and mutant CueO proteins exhibited higher degradative activity at 60 °C than at 30 °C. The mutants exhibited higher oxidation activity than the wild-type enzyme at 30 and 60 °C. Therefore, the mutants have considerable potential for applications involving benzo[α]pyrene degradation. In this study, the two substrates (ABTS and benzo[α]pyrene) were selected to evaluate the catalytic efficiency of the wild-type CueO and mutants. There are lots of substrates for the laccase. If the laccase could oxidize the substrate ABTS with high efficiency, the laccase usually has the good catalytic efficiency to other substrates (Camarero et al. 2012; Prins et al. 2015). In the future study, the other substrates will be used to evaluate the performance of those mutants. The metagenome contains plenty of genetic resources and can be used to search for the novel gene or mutation (Pardo and Camarero 2015). In this study, the mutation G276R of laccase CueO was identified based on the metagenome of a chemical plant sludge, which showed better catalytic properties compared to the wild type. Other mutants (G276K, G276Y, and G276N) at this site were also screened from the saturated mutation library and exhibited better catalytic properties compared to the wild type. The G276R, G276N, G276Y, and G276K mutants could oxidize the carcinogen benzo[α]pyrene more efficiently compared to the wild-type enzyme. This study found a novel cueO residue G276 that can affect enzyme activity, and some mutants at that residue could be useful for biological remediation. Conceived and designed the experiments: JT, NW. Performed the experiments: QY, YY, JZ LZ, and LX. Analyzed the data: QY and YY. Contributed reagents/materials/analysis tools: XC and XL. Wrote the paper: QY and JT. All authors read and approved the final manuscript. All authors approved the consent for publishing the manuscript to bioresources and bioprocessing. There is no competing interest for any of the author regarding the submission of this manuscript. This work was supported by the National High Technology Research and Development Program of China (863 Program, 2013AA102804). 40643_2017_178_MOESM1_ESM.pdf Additional file 1: Table S1. The primers used in this study. 40643_2017_178_MOESM2_ESM.pdf Additional file 2: Figure S1. Sodium dodecyl sulfate–polyacrylamide gel electrophoresis of recombinant CueO and its mutants produced in E. coli BL21(DE3). Lane 1 The wild-type CueO. Lane 2 The mutant G276R. Lane 3 The mutant G276K. Lane 4 The mutant G276Y. Lane 5 The mutant G276N, the proteins were purified through the Ni-chelating affinity chromatography.